Off to the program’s best start in quite some time, the current 3-0 Gaels have yet to be tested in 2018 and a big reason for that has been the electrifying performance of their senior dynamic duo in the backfield, Seth Surrett and Myles Proctor….We highlighted the former during the first week of the regular season and now it is the latter’s turn to bask in the spotlight. An individual who was considered as a POTW candidate last weekend following a 13-carry, 112-yard, 1 TD performance in a 28-0 victory over Nazareth Regional, when we saw Proctor’s numbers from this past Saturday, we were glad we waited the extra week so as to capture his true breakthrough. Playing only during the first half, the 6’2, 190-pounder out of Yorktown Heights not only logged his second straight 100+ yard showing, he went above and behind, exceeding the 200-yard mark for the first time in his scholastic career in the KC’s 35-0 blanking of St. Dominic’s….Carrying the ball a mere nine times on the afternoon, the 12th grader would rack up a career-high 215 yards (of the 267 earned collectively by the school), scoring three times on treks of 77, 55, and 11 yards…He would also find the energy to record five tackles from his linebacker position on defense to help the Gaels to a second straight goose-egging of the opposition. Averaging an astounding 141 yards per contest through week #3, Proctor currently leads the “A’ division in all major ground categories with 423 yards on 35 carries (12.1/touch) and four touchdowns. His 13 total stops also ranks him in the top-10 among Gaels in tackles this season. Up next for the Gaels will be a week #4 clash against the defending “A” titlists, Cardinal Spellman. With both teams still undefeated in league play, more than a few pundits are calling for this to be the first of two [also during the last week of the regular season] championship game previews…The host Pilots have yet to surrender a single point against “A” opponents this season. On the contrary, KC is putting up an average of nearly 33 points per game and have not been held below 28 yet. When you are the reigning Double-A Offensive Player of the Year and a returning 2nd Team All-State selection, one of the biggest challenges you face week after week is the pressure of trying to adhere to your own personal standard of excellence that at times borders on the realm of impossibility…When you are the red-headed assassin who dons the #10 jersey for the defending champion Firebirds, anytime you can succeed in raising the bar for yourself, it is a mighty big deal since that proverbial bar was already incredibly high to start. 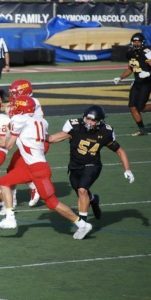 This past Saturday night in a game that was being billed as a potential early preview of championship weekend, Sluka would emerge with statistically the best overall game of his two-year high school career in a 47-14 triumph on the road over Xavier. 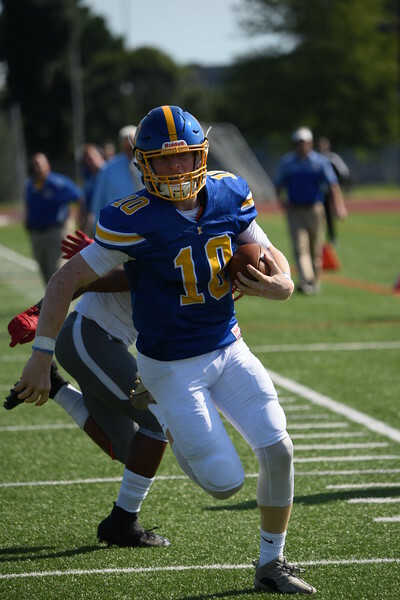 Improving his record under center to a perfect 14-0, the 6’3, 205-pounder from Roslyn established new personal bests for total offense (362 yards) and passing yards (232), while also tying his previous record of five (set in last year’s AA title game) touchdowns. Completing 9 of his 11 attempts in the air en route to the aforementioned new milestone, Sluka would post his first three-touchdown-passing effort as a member of the Blue & Gold…Connecting on all three TDs with fellow senior/Week #1 POTW honoree, Matthew Mongelli, Sluka’s first touchdown pass of the game would go for 60 yards and tie the game at six apiece in the first quarter…Leading 12-6, it would be his second dart of the half, a seven-yard strike that increased the lead to 19-6….Sluka’s final home-run hitter of the day would be his longest, as he displayed laser precision in lofting the ball over the outstretched arms of a defender to hit Mongelli along the sideline for an 85-yarder to make the score 40-14. The state leader in yardage and rushing touchdowns by a quarterback last season in New York State, after being held to just 21 yards in the team’s season-opening victory over Holy Trinity on September 8th, Sluka has regained his top form during weeks 2 and 3, running for 117 and 130 yards respectively and combining to score five touchdowns with his legs…In the “w” over the host Knights, Sluka had one TD run in each half, including a 62-yard pilgrimage in the 3rd quarter in response to Xavier’s touchdown on their first possession of the final 24 minutes. Sluka also converted on four of six PAT tries to play a role in 34 of the 47 total points accumulated by Kellenberg. Well on his way to another All-State distinction, what has stood out most about Sluka has been the balance he has demonstrated in his attacks. A year removed from scoring 70+ percent of his touchdowns on the ground, through three weeks of the season, he is putting up nearly a 1:1 ratio (6:5 to be exact) where his passing talents are slightly outweighing his contributions as a scrambler…Thus far, his stat line reads as follows: 30-for-43 (69.8%) for 513 yards and six TDs in the sky; 268 yards and an additional five scores on 30 carries (8.9 average) via the ground. This is Sluka’s third career POTW distinction. As a junior, he had the rare honor of being named twice in a span of three weeks (3 and 5). In the case of the 5’7, 165-pound, senior tailback [Spano], much of scholastic career in general and his senior season in particular has been about doing all of the behind the scenes work so that it could be his teammates that were afforded the privilege of being the headliners…A dedicated lead blocker who despite never being the biggest guy on the field seems among the first to throw himself into harm’s way in order to create a hole for one of his peers, the influence that the Bay Shore resident has on the success of the running game far exceeds what you will in a weekend box score. With these sentiments in mind, there is nothing more special or fitting then when the facilitator finally gets his moment to be the star. And that occasion came to pass in the Cougar’s 51-6 win on September 22nd over Nazareth Regional. Entering the week #3 contest having gained just 90 yards on 21 hand-offs (4.3/carry) this season, Spano would transform himself into an undeniable force, requiring only six touches to amass 200 yards (33.3 average). Included in his career-day would be a 30yrd run in the second quarter that gave SJB a 21-0 lead. He would also have a 93-yard blast to set up an additional score. Not one to allow personal achievements to cloud the strong sense of “team” instilled in him by Coach Carusillo, Spano would continue to add to his reputation as a fierce “chaperone” for his fellow ball carriers. With him serving as a human battering ram, Jayden Louis (60 yards on five carries) and Christian “Marvelous Mister” Maisel (38 yards on three hand-offs) each scored a pair of touchdowns…All in all, the West Islip based program accumulated 325 yards on the ground to improve to 2-1 this season. The epitome of a “no job too small” philosophy, Spano rounded out his impressive day by doing solid work in all facets of special teams. Our lone defensive player of the week recipient, the Friar senior checked off so many different boxes in the school’s 28-7 victory over Christ the King, last Saturday, that he made it impossible to ignore him. Facing one of the most naturally gifted offenses anywhere in NYS that featured a running back holding a scholarship offer to the University of Michigan, a quarterback being actively watched by the likes of Penn State and Ohio, and several additional future college players at the other skill positions, the St. Anthony’s “D” would limit the Royals to no more than a 2nd quarter touchdown. Showing himself to be a complete linebacker who is equally effective in both run and pass coverage, there wasn’t much more that the 5’11, 205-pounder could have done during week #3 to add to his statement-making afternoon. 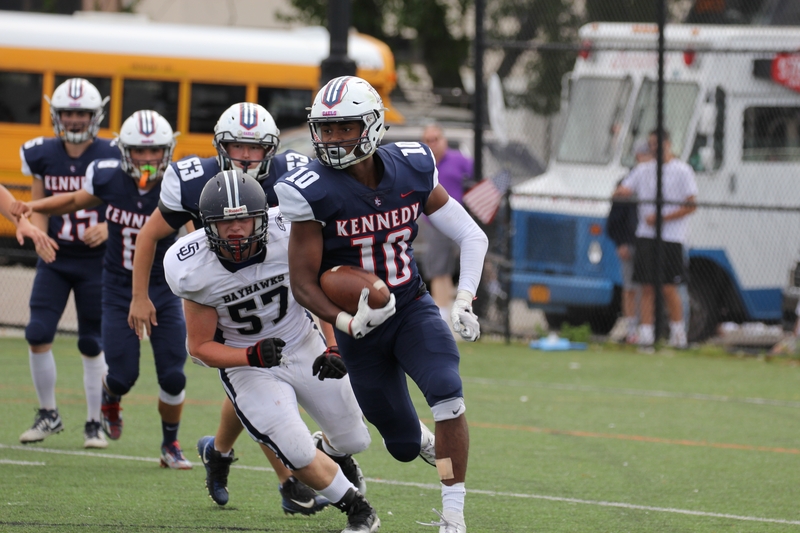 Credited with 14 total tackles, Costanzo was a big reason why CTK’s highly routed tailback [Tirek Murphy], was kept to only 15 yards (on 8 carries) and the Middle Village school as a whole mustered only 78 yards gained on 27 attempts (2.7 average). The STA 12th grader also shined in passing down situations, as he earned a quarterback sack and had one of two interceptions [Nick Espada accounting for the other pick] on the day for the boys from South Huntington. Speaking of creating turnovers, the INT was one of just three change of possessions that Costanzo had a direct hand in bringing to fruition. His truck-like hits to ball carriers also resulted in a pair of forced fumbles. Now, as the Reichert-guided Friars inch closer to a week #4 rematch of last year’s triple-A title contest against a very diverse and athletic Stepinac offense (averaging 438.6 yards of total production), the D-unit will be counting on Costanzo to remain locked in…Should the front seven be successful in matching their intensity from last week, the Friars have every reason to feel confident about their prospects of improving to 4-0 in 2018. Back-to-back weeks that a Titan is being recognized, last time it was the muscle [John Stroughn] catching our eye, whereas today, we are pleased to acknowledge the finesse/skill [Riccobono] of the operation. 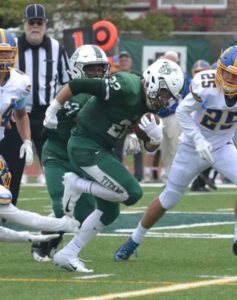 Turning the clock back to 2016, when Holy Trinity averaged over 37 points per game behind All-State tailback, Umari Taylor, the Tony Mascia-mentored cohort threw “half a hundred” on the scoreboard for the first time in two years this past Saturday in their 50-20 victory over St. Joseph’s by the Sea. Providing the spark and further asserting himself as someone who is destined for present and future greatness was the junior tailback out of New Hyde Park, who maintained his workhorse status for a third straight weekend…Setting new career benchmarks for total carries (27) and yards gained  in the team’s second win of the season, Riccobono’s pair of touchdowns on the ground were two of the five in all that the Hicksville based school plunged into the end zone on September 22nd….He has now scored at least once in every appearance in 2018 and will head into the fourth week of the regular season riding a two-game two-touchdown streak…His 146-yard showing, which came as a follow-up to the 123-yard show he put on during week #2, made it consecutive 100+ games for the 5’9, 185-pounder. To accomplish this twice in a matter of attempts, is a sign of a potentially revolutionary player. Scoring both of his touchdowns in the 2nd quarter, Riccobono would turn a narrow 15-8 edge into a comfortable 29-8 half time advantage when he broke free on runs of 4 and 9 yards respectively to conclude the first 24 minutes of competition. After three games, Riccobono’s [115.3/contest) 346 yards and five touchdowns both rank within the top-3 in the Double-A division. Punching the clock on the defensive side of the ball to boot, Riccobono finished the game tied for 3rd on the team with five stops and earned his first sack of the season. Playing their best game of the season, the front seven held the foes from Staten Island to a modest 2.2 yard/carry average (35 yards on 16 hand-offs). For those who do not put much stock in the saying, “It’s not how you start, but how you finish”, consider for a moment the day that the 6’5, 190-pound Lions signal caller [Regan] had this past Saturday in leading the Maroon & Gold to a 34-20 conquest on the road over Chaminade….Commencing the game by missing on his first three passing attempts, if you were to rush to judgement, you’d say that week #3 was not going to be a banner one for the Staten Island resident…YOU’D BE WRONG!!! 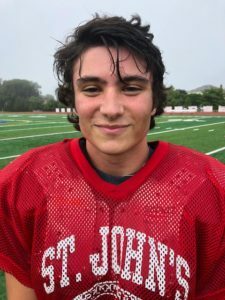 Calling it “The most efficient and complete performance” of Regan’s two-year varsity career, Head Coach, Anthony Garofalo, had nothing but praise for his field general, as he witnessed his team start the season 3-0 for a third year in a row. Battling back from his initial struggles, Regan transformed himself from mortal to Marvel Comics character, as he was about as close to “Bullseye” as you could be for the remaining 3.5 quarters…Connecting on 13 of his final 14 attempts, the Lion co-captain hurled for 187 yards (3rd highest single-game total) and tied his personal best of three touchdown tosses in earning the first Player of the Week designation. In synch with junior wide-out, Christian Tait (caught 10 of the 13 completions) all afternoon, Regan would double his team’s 7-0 lead in the second quarter when he found his teammate over the middle on a 16-yard strike for the first of their three hook-ups to make the score 13-0…Later in the quarter, it would a perfectly executed over-the-shoulder throw from approximately the same distance to make the score 20-0….The #10 to #13 TD trifecta would be capped off at the onset of the 3rd quarter and would be in response to the host Flyers’ touchdown on their first possession of the 2nd half, keeping the contest a three-score affair, 27-7. Quite adept with his legs too, Regan was the furthest thing from one-dimensional last Saturday, as he tied his personal-best of nine carries and fell just short of a career-high in yardage (87 last season) with 80. After completing 51.6 percent (79-for-153) of his passes for 892 yards and nine touchdowns as a junior, the “skyscraper in the pocket” is on track to obliterate his 2017 stat line, as he is currently sporting a 68.1 completion percentage (32-of-47), has already rocketed his way to 390 yards, and is just four TDs short of reaching double digits…His 156 yards on the ground puts him more than half way to the 310 he gained as an 11th grader. Farrell will face their biggest test of the season thus far in week #4 when they go toe-to-toe with Cardinal Hayes…In their 51-48 loss to Iona Prep, the Cardinals secondary, which consists of several new faces, allowed 324 yards and four touchdowns. Thus, unless they gelled in a hurry there could be openings to exploit for Regan and the MF receiving corps.